Advent is nearly here and I could not be more excited! If you read my previous post on the topic, this is the first year that I've really known what Advent was. Until recently, I did not realize it was actually a tradition and celebration all on its own, but thought that it was just a fancy name for a countdown to Christmas. Now that I truly know what Advent is all about, I cannot wait to celebrate. In my previous post, I shared various ways to celebrate Advent with children and why that's important... but it's not just important for them, its as important for us too. I don't know about you, but my holiday schedule is already filling up quickly! There are holiday parties and family gatherings to attend. There is holiday shopping to finish and presents to wrap. There are halls to be decked and trees to be trimmed. There are cookie to bake and stockings to stuff. There are so many holiday festivities to enjoy...and so little time to enjoy them. With so much to do, it can be easy to be overwhelmed with it all. We can forget to take the time to truly reflect and remember what the holidays are all about. And that's just what celebrating Advent allows us to do, it gives us those daily and weekly reminders to focus on Jesus. Aside from the lighting of the Advent candles and counting down the days on an Advent calendars, there are many great resources to help put our hearts in the right place... like a great Advent devotional. 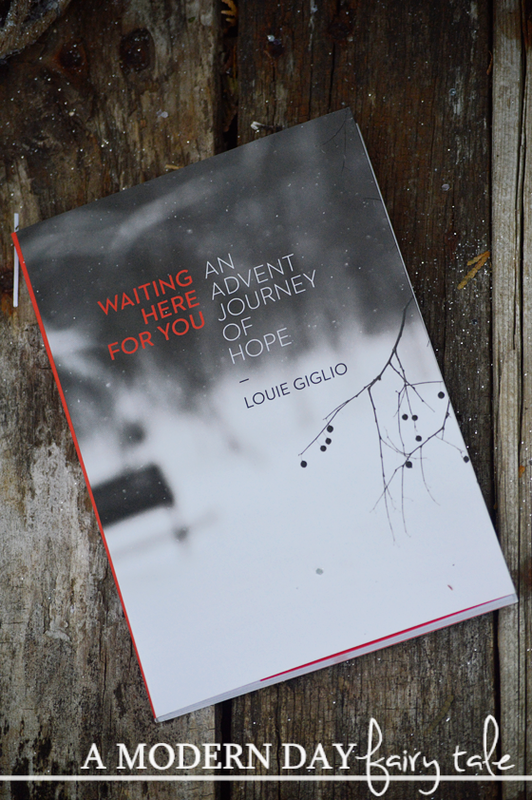 Today, I'm sharing one such devotional- Waiting Here For You: An Advent Journey of Hope. It comes the same time every year. Christmas. We have plenty of time to anticipate it, or in some cases...dread it. And, before we know it, it's gone as quickly as it came. What's it all for? Is there really hope for today in the story of a baby born so long ago? These questions and others are answered in the promises of Advent. Advent is simply a season of expectant waiting and preparation. Most often, the arrival of an event or a person is made all the more sweet by our anticipation. How could waiting and expectation change your Christmas season? 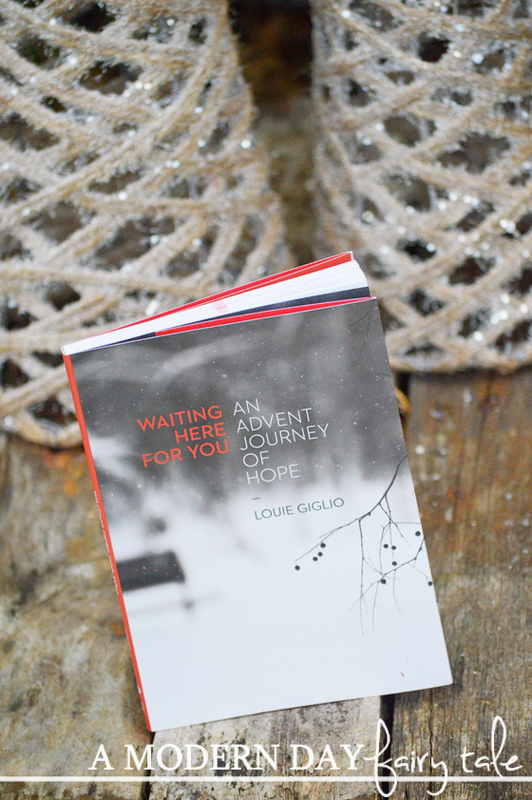 Join pastor and author Louie Giglio in an Advent journey to discover that waiting is not wasting when you're waiting on the Lord. Take hold of the chance to uncover the vast hope offered through the journey of Advent. In Waiting Here for You, readers will find peace and encouragement for their souls as anticipation leads toward celebration! Starting on November 26, this fantastic book features a brief devotional leading up to Christmas day. Each day includes a passage from the Bible, thoughts to reflect upon, a poem/song to meditate on and a prayer. Now, perhaps you're thinking that with your packed holiday schedule, you simply don't have time to add in a daily reading. But the great part if that these devotions are very brief... perfect to read and reflect upon over your morning coffee, lunch break or whenever you can take a few minutes in your day. But despite their short length, they are packed full. Now I will admit, I haven't actually finished reading this book in its entirety, as I do plan to read myself during the Advent season, and wanted to do so with a fresh look each day. Instead, I read a few passages throughout to get an idea to share with all of you...and so far I am really loving what I read! I found this to be a great read not only in anticipation for Christmas, but for anyone who is waiting for anything- be it a new job, trying to have a baby or any one of the many occasions that keeps us in a state of anticipation. I cannot wait to dig deeper into this devotional as the holidays draw closer. Waiting Here For You is available to purchase now at Family Christian. Love the jewelry, thank you! I love all of their Christmas Decoration!!! So gorgeous! My daughter would love the Sterling Silver Heart Pendant Necklace with Cross. So pretty. Love the jewelry. So nice!